“Behind Locked Doors” A sermon on John 20:24-29 | When I Survey . . . The Second Sunday of Easter, traditionally called “Low Sunday,” is a tough Sunday for a preacher for a number of reasons. First of all, the context of our preaching can be a bit discouraging. We have fewer than half the people we had last week, and I always preach better for some reason when there are more people present. It must have something to do with group dynamics. Easter is always a high holy day in the church, a bright and festive day, and though the church in theory believes that Easter lasts for the Great Fifty Days, the second Sunday is, well you know, Low Sunday. Plus I am always exhausted and worn thin after Easter. But having said all that let me make a confession: I like low Sunday. I like it for two reasons. First, the folks who come on Low Sunday tend to be the faithful core of the congregation and I feel I don’t have to explain so much of the Gospel to you. To use Eugene Peterson’s helpful distinction, on Low Sunday there are more pilgrims and fewer tourists. I say that not to disparage religious tourists, God knows we have all been that at one time or another. God meets us where we are and even spiritual tourists need God’s mercy and love. My point is just that hardly anyone feels a pressing social or cultural need to get up and come to church on Low Sunday, so those who are here tend to be serious about what we are doing here, and I appreciate that, since I am serious about what we are doing here. But the second and more important reason I like Low Sunday is that it speaks deep truths about how the risen Christ comes to us. Low Sunday is sort of a down and out Sunday, and the Lord Jesus seems to appear especially to the down and out. If you read the stories of the resurrection appearances it is startling that without exception the disciples are doing nothing especially religious when Jesus appears to them. They aren’t praying or worshipping. In Luke they are walking on the road lamenting what had happened, or they are fishing, having given up their discipleship to return to their day job. Here in John’s Gospel on Easter night the disciples are in a locked room, hiding in fear. And it occurs to me that is the church’s natural state: a bunch of scared people locking out the world. You might argue that the disciples are not yet the church, until Jesus comes to them and gives them the Holy Spirit (John’s version of Pentecost) and you would be right. The church without the risen Christ and the Holy Spirit is just a bunch of quite literally dispirited people hiding in fear from real and imagined enemies. And that is one of the reasons I like Low Sunday. The disciples are so obviously failures at being disciples and so they share that in common with us. It’s Easter and they don’t even know it. They have nothing to offer as the church, no vision, no energy, no courage, no conviction. They are hiding. They are afraid. As far as they know Jesus is dead and done. The shepherd has been struck down and the sheep have scattered. They should have believed the witnesses. Peter and the beloved disciple have been to the empty tomb. They have told the disciples what they have seen. Mary has told them she has seen the Lord. They should have believed, but they didn’t, and yet Jesus still comes to them. So this isn’t a story about the disciples or doubting Thomas so much as it is a story about Jesus. We always want Jesus to meet us at our best, to help us to improve us, but instead he meets us at our worst, and he doesn’t care about improving us. He comes not to offer improvement, but resurrection. He comes not to bring the world as it is, only “better oiled,” but a new heaven and a new earth. And so he comes to these dispirited disciples hiding behind locked doors, and he comes to us hiding among our manifold fears and anxieties. He comes among us and finds us worrying about our money and our health and our future, worrying about our image and our reputations. He finds us ready to hide behind locked doors to keep the world out. He finds us afraid that we will be found out, that it will become known that we are not as courageous, virtuous and committed as we have led people to believe. If people really knew how self-centered and selfish we are; if they only knew that we can be stinkers and schemers, can act dishonorably and shamefully, childishly stubbornly. If they only knew. But Jesus does know and still he comes among us and stands there with his wounded side and those dreadful broken hands and says “Peace be with you.” And if that isn’t good news, I don’t know what is. And then he says something most astonishing: “As the Father has sent me, so I send you.” There must be some mistake. He can’t mean us. We are hiding in fear behind locked doors. But there is no mistake. And this is the beauty of the church. We are the ones he sends, not the virtuous, the strong, the wise, the courageous. No, he wants us, sends us, foolish men and women, and slow of heart to believe. And Thomas missed it and can’t buy it, can’t believe it. 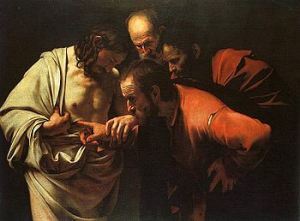 They said, “We have seen the Lord.” But he said to them, “Unless I see the mark of the nails in his hands, and put my finger in the mark of the nails and my hand in his side, I will not believe.” So there! And Thomas is the church, too. Practical, not given to flights of fancy or imagination. Thomas is the church in all its stubborn, hard–headed practicality. He had been a disciple, sure, but look what happened to Jesus. It was time to get back to reality, back to basics, back to practicalities. Show me or I won’t believe. And once again the good news of Low Sunday is Jesus comes to Thomas, comes to the church in all shortsightedness, in all its stingy fearfulness, all its ingratitude. Jesus comes and says, you want to see, see, you want to touch, touch. That’s the beauty of Low Sunday, the real Easter story is not so much last week among the lilies as it is here among the few of us who have gathered to hear how the church began with these fearful disciples. And if we can dare to believe that God raised Jesus from the dead, can we not dare to believe that he can raise us too, not just when we die or at the resurrection of the last day, but now, raise up a church, a people who on their own are dead or as good as dead, afraid and hiding, but who when he comes among them are raised to life, raised to become the church. To love as he loves, to forgive as he forgives. On Wednesday I dragged myself to come to church to two committees meetings that met at the same time. When I came in there was one person at the first meeting, and when I went down the hall there was only one at the other. There were some important things to be done by each committee, but it was not to be done that night. On the way home I was complaining a little bit to the Lord, and I thought, well, people are busy, and they are volunteers, and its Easter, and finally I said, Lord, if you want something to happen here, you better do it, because we are not up to it on our own. And then I had my sermon. Of course we’re not up to it on our own. What was I thinking? We never have been and we never will be. But still he comes among us, still he sends us, still he calls us to be the church. And then I had two funerals, one Friday and one yesterday, and at those funerals I saw the faces of the people as I told them the good news of the Resurrection, the good news of the Gospel, the Good news of Easter, and I thought, yes, this is the church. This is why we’re here, this is what we are here to do. To be witnesses to the risen Christ. To tell people he lives, and we can live too with him. So I may feel a little low this Sunday, and you may feel a little low this Sunday, and this Sunday may feel a little low this Sunday, but the Risen Christ comes to meet us when we’re low, in fact, more likely than when we’re not, and when he comes he bids us peace and send us out in the power of his resurrection. We’re coming out of our locked doors. We don’t need to hide. There is nothing to fear. Because it may be Low Sunday, but its still Easter. Amen. This entry was posted in Church, doubt, Doubting Thomas, Easter, Low Sunday, resurrection and tagged Low Sunday. Bookmark the permalink. Thanks, Janet. As always, your encouragement means much to me.